APPLESandRUBIES: Loretta Fontaine's Older Blog: Jewelry Giveaway! Would you like to win a pair of Loretta Fontaine Jewelry earrings? (They're reversible - hence the two sides!) It's a favorite design that features my own miniature original b&w photography of a fern. Become a follower of my blog, APPLESandRUBIES and leave a comment below for a chance to win. If you put this giveaway on your blog or Facebook just let me know and that will give you 10 additional chances to win. Give this giveaway a "like" on the Loretta Fontaine Jewelry Facebook page for even another chance! This is too much fun! Good luck! We've already got some comments on our interview. Looking forward to the excitement your pretty earrings generate. I'm happily following and posting on FB, and love your jewelry. If I don't win, I'd be interested in buying these earrings. Loretta, I love your jewelry. Found you on Craft Life and Style and that from BlogFrog/SITS. I'll also "like" you on FB. Great interview, too. Loretta, you need to sell in Colorado! Your pieces are exquisite - galleries in Aspen, Boulder and Vail would easily entertain the opportunity to host you! Sarah,You already know I love your blog! Quay Po- Lovely blog, too, but makes me hungry. I'll have to try one of your tempting Malaysian recipies. Angela, (I assume this is the Angela who married her high school sweetheart, right? ), You are too kind. I had a gallery interested years ago in Colorado and should follow up! Amazing earrings! Really unique and beautiful. I am glad I discovered your jewelry and the interview was inspiring. You are very talented. Love these! Perfect timing on your giveaway for the holiday season! M.
These are AMAZING and I love them and want them! Great giveaway. 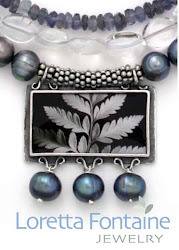 I am amazed that you can incorporate photography into jewelry design. What a truly inspired melding of technology and the artist's eye. I would never have guessed that would even be possible. These are so beautiful! 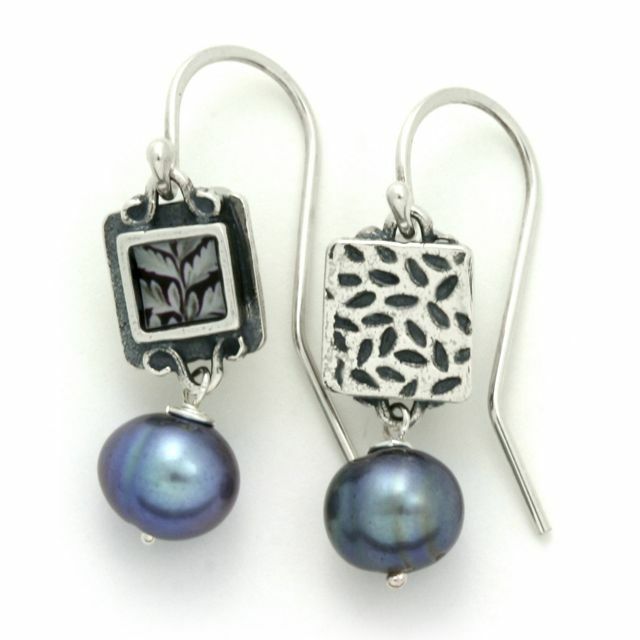 I have always loved ferns, and your photography really does bring the lovely shapes of the fronds into the earrings. Brilliant!! I shared the giveaway on my facebook profile as well. I am only an occasional blogger, and I'm not even quite sure how I happened across your blog, but I'm glad I did. You are extremely talented. Lovely! Thanks for including me. Happy Monday! I am feeling lucky! Love your jewelry design! Thank you too so much for dropping by my blog. Cristin- Thanks for coming by! You know I love Simplified Bee! Good luck! Okay, I'm back - so glad to know I complete you! And well, I never win anything so. . . :-) Love the site - glad to be connected. A comment? I'm so happy to hear from YOU! find me at Delmar Open Studios this weekend! pve - earring giveaway WINNER!